Our school has a “Spud Harvest” break. It’s two weeks during September and October when the kids get out of school to, well, harvest potatoes. We look forward to this break from the first day of school. It’s a perfect time to have the boys help with some of the last minute fall jobs on the farm and around the house. I love having my boys home and will take them anytime I can get them. 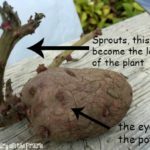 Since, we are enjoying our “Spud Harvest” right now I decided to celebrate with a week of potato recipes. New red potatoes are one of my favorite things from the garden. There are so many ways to fix them up. And everybody loves potatoes. My grandma used to make potato bread, and it was the bomb! I can still smell it. My mom used to make Spudnut Doughnuts in the fall and they were always a hit. There’s just something about adding mashed potatoes to bread that gives it an amazing texture. These Spudnut Cinnamon Rolls are a twist on the original Spudnut Doughnut recipe. They are melt in your mouth good. I glazed them with a doughnut glaze. That was a good choice because the glaze settled in every little crack and crevice. Yum! 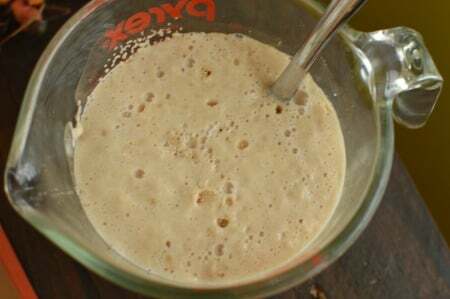 Add yeast and sugar to some water and let it get bubbly. While the yeast works its magic…Scald some milk. 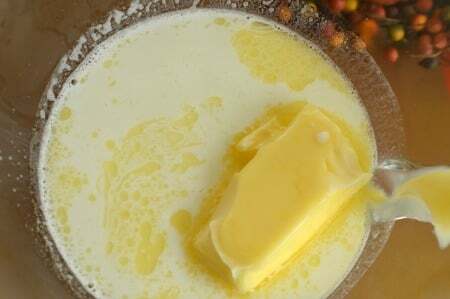 Add milk, salt, sugar and butter to a mixing bowl. Add mashed potatoes to that mixture. This is a perfect place to use instant mashed potatoes. Just make sure they are real instant potatoes. We bough a bunch of “Potato Pearls” for our food storage so I used those. Stir it all together. Then add beaten eggs and stir again. Add the proofed yeast to the mixing bowl. And stir to combine. Sift flour into bowl. 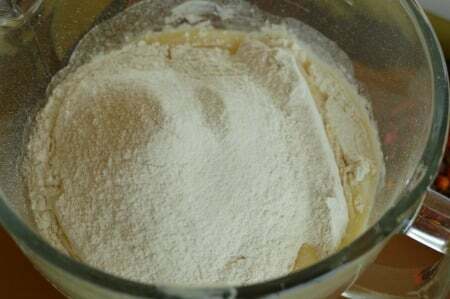 Mix and add additional flour until dough starts to come away from the sides of the bowl. Cover and let rise in a warm place until doubled. About and hour. 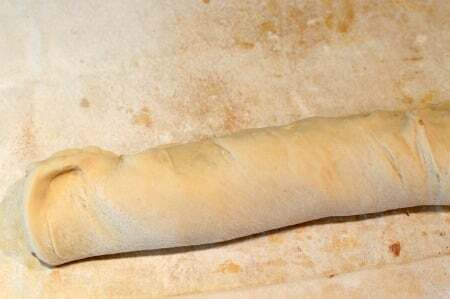 Roll dough out on a floured or oiled surface. Between 1/4″-1/2″ thick is perfect. Generously butter! Generously sprinkle with sugar and cinnamon. Roll into a…roll. Pinch seems. Cut rolls into pieces. I ended up with 16 rolls. Place on greased baking sheet. Let rise until doubled. Bake at 350 degrees for about 15-20 minutes. You don’t want to over bake them. While rolls are baking whip up a glaze. 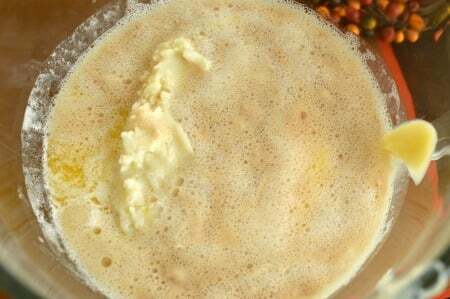 Stir together powdered sugar, vanilla and warm evaporated milk. Keep stirring, or whisking, until it’s nice and smooth. It will be runny because it is actually a doughnut glaze not a frosting. I happen to love the whole glazed cinnamon rolls thing. While the rolls are still warm spoon glaze over each roll. Let them sit for about ten minutes to soak up the glaze. Then glaze them again. I told you I love the whole glazed cinnamon roll idea. 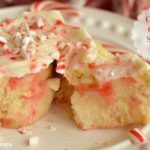 I’m pretty sure that you will love the whole glazed cinnamon roll idea too! What’s not to love about glaze drizzled down all of those crevices? If you don’t eat them all right away be sure to microwave them for just a few seconds before eating the leftovers. All cinnamon rolls are better warm. 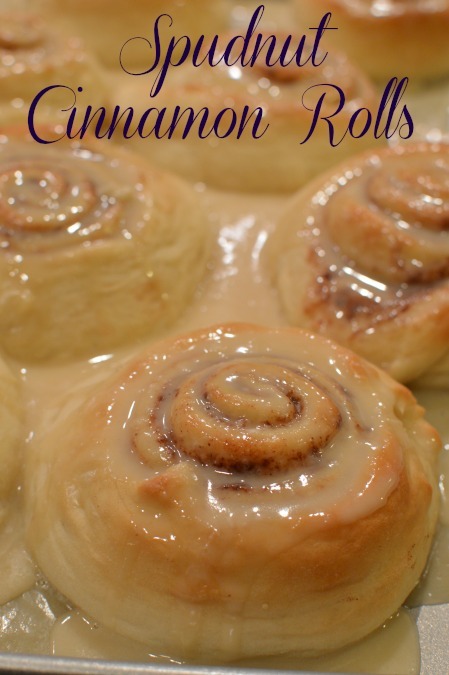 If you love the texture of potato bread, you will love the texture of these cinnamon rolls. If you love glazed doughnuts, you will be in love with warm vanilla glaze seeping all the way through your cinnamon roll! If you love the texture of potato bread, you will love the texture of these cinnamon rolls. If you love glazed doughnuts, you will love warm vanilla glaze in every bite. Mash potatoes or mix instant potatoes. Dissolve yeast and 1 T. sugar in warm water. Let sit until bubbly. 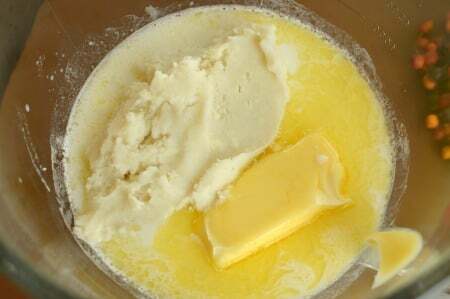 Add butter, ¾ c. sugar, salt, milk, and mashed potatoes to mixing bowl. Gently stir until combined. Add beaten eggs and stir again. Add yeast mixture to potato mixture and stir again. Sift 5 cups of flour into potato mixture. 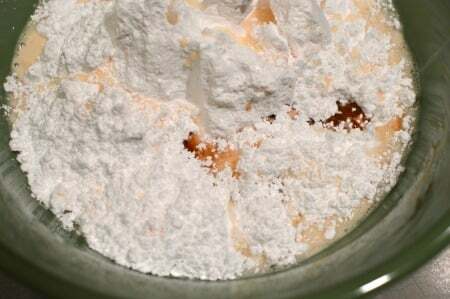 Mix, adding flour one Tablespoon at a time until dough begins to pull away from the sides of the bowl. Cover. Let dough rise until doubled. About and hour. 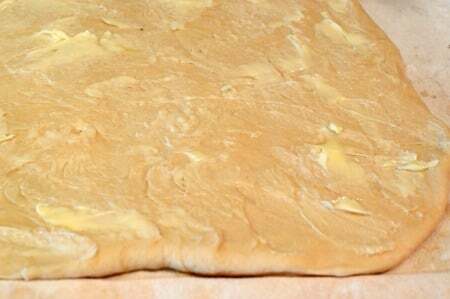 Set dough on a floured or oiled surface. Roll out about ¼"-1/2" thick. Generously spread with butter, about ½ cup. 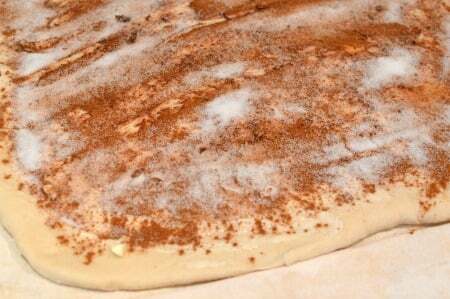 Generously sprinkle with cinnamon and sugar. Roll up jelly roll style. Pinch seems together. Slice into rolls. I made 16 large rolls. Set on two greased baking sheets. Cover. 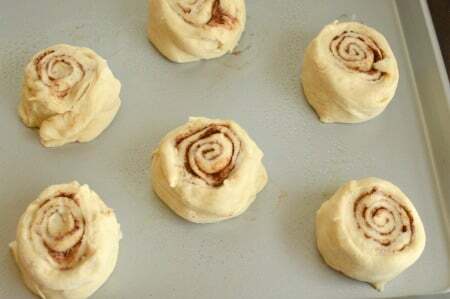 Let rolls rise until doubled, about 30 minutes. Bake at 350 degrees for 15-20 minutes. Don't over bake. While rolls are warm spoon glaze over the tops of the rolls. Let rest for about 10 minutes and spoon more glaze over the rolls. While rolls are baking make glaze. Mix all ingredients together and whisk until smooth. So pretty, and baked to perfection. I will have to remember to not over or under bake them this time, so they are just right. 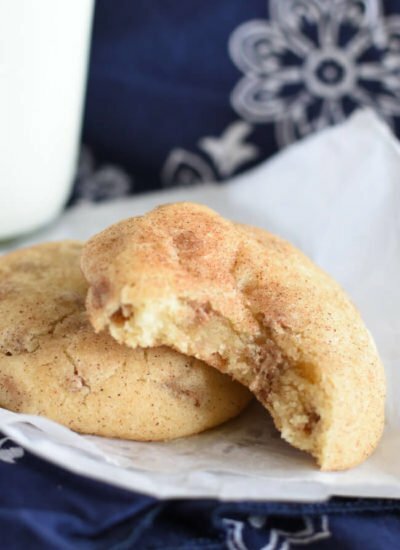 I love cinnamon rolls, and potato cinnamon rolls are a big step above just plain ole cinnamon rolls, so I can’t wait to try them. 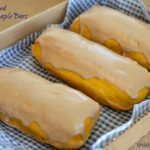 Like you said, Grandma Berrett made the best potato bread ever, and in the fall I loved making spudnuts with a donut glaze, so this is a perfect combination of all good things. What lucky little boys to not have to work in the potato fields during spud harvest, but instead they get treated to spuds during their school break. Enjoy it while it lasts, because all too soon they will be back in school and you will be looking forward to the Thanksgiving and Christmas holiday breaks, so they can again be home for a few days in a row. 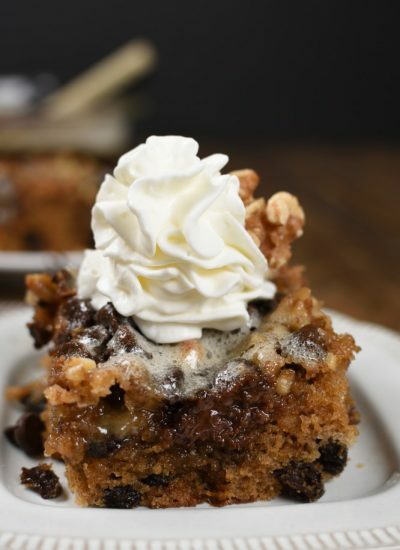 Looks good– do you think it would be good with the brown sugar and cream “gravy” on bottom, or would that be too sweet? (Can anything be too sweet!?!?!) Just wondering your what your thoughts are on that?? 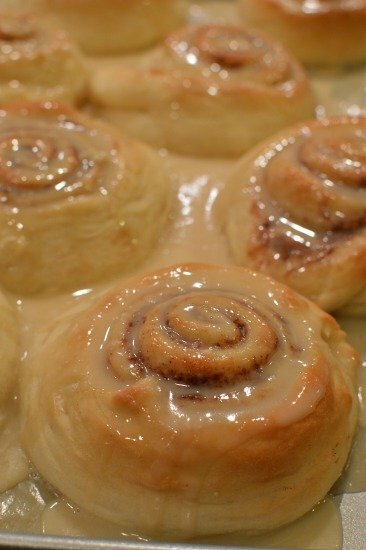 We love the cinnamon roll gravy, but after going to the bother of making homemade dough, I’d hate to ruin it! I’m with you, there’s not such a thing as “too sweet”. Although I love these just the way they are! 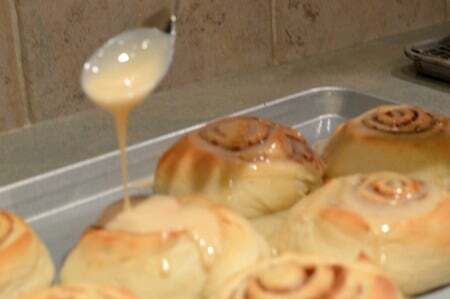 I do have cinnamon rolls on the brain and and thinking of trying something new with the “gravy” idea! Hopefully the idea that is running through my head is as good as I’m imagining! If it is, of course I will share! These look and sound so good can’t wait to try them. Thanks for sharing. I am thrilled you shared this recipe at the Future Expat Required Ingredient link party. It’s exactly the type of recipe I was hoping for when I chose potatoes for this week’s ingredient. I love the idea of exploring all of the different ways an ingredient can be used…especially in those recipes you would never have expected. Thanks for sharing. Since I live in Idaho we are die hard potato fans! You just can’t go wrong with them! Stopping by from SweetAnne required ingredient and I MUST try these! 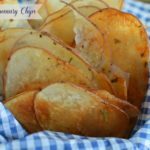 Congrats for having one of the most creative potato recipes from last week’s Required Ingredient Link Party. 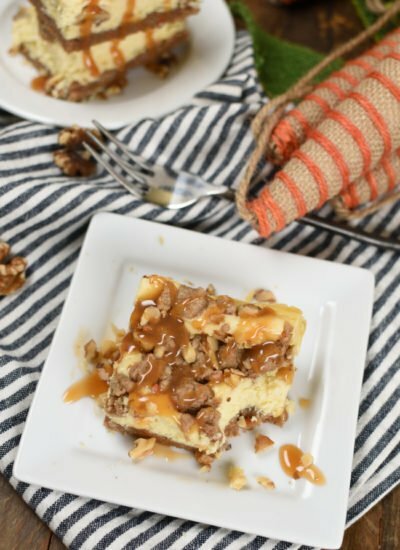 I’ve featured this recipe on today’s party, and hope you’ll come join us again. Today’s ingredient is pumpkin. 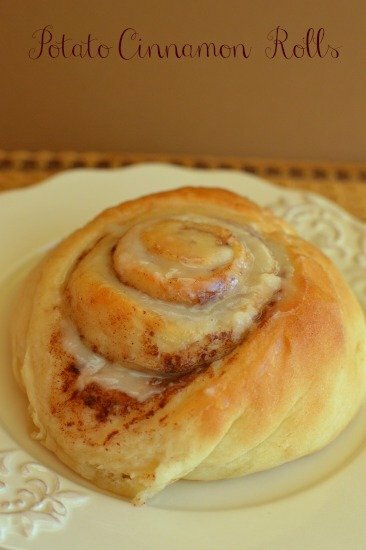 Thanks for featuring my Spudnut Cinnamon Rolls! Since I live in Idaho we eat potatoes all of the time. We eat them in lots of unexpected ways too! Thanks for inviting me to your Pumpkin Party today! I hopped over and joined the fun! Wow, this recipe looks like a winner. Have pinned it so I can try it soon, am always on the lookout for fantastic bread recipes, thanks for sharing. Potatoes make the dough so soft! Hope you enjoy them as much as we did! These look awesome! I really need to get on the potato roll bandwagon…they always look so fluffy and delicious! Thanks for sharing at Saturday Night Fever! Thanks! I have blogging and my kids love eating all of the food, after photo’s of course! I’m currently in the process of switching hosting companies. Right now I am with Dream Host! Hi Amy. I just found your site. I really want to make these for breakfast tomorrow. But would love to make them the night before. Is that possible? I replied to your comment quite awhile ago. I don’t know where it went. So sorry! 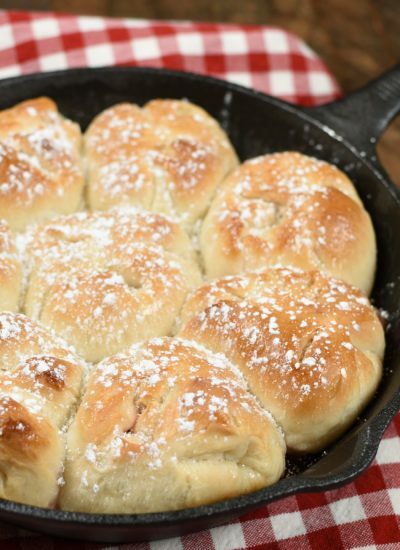 I make these the night before all of the time and they are still wonderful the next day!Like most bread they are better right out of the oven. But…that’s not very practical for me though! Hope you tried them and loved them! Living on Cape Cod my favorite way to use potatoes is in a chowder then mashed. Looking forward to trying it in a bread! Glad I stumbled upon your site. Excellent writing in your blog and great pictures with step by step instructions. Thanks! I’m glad you found me Jacqueline! Since I live in Idaho and grow lots of potatoes in my garden we eat plenty of them. They are so yummy I never get tired of them though! They make these cinnamon rolls extra soft! Let me know how they turn out for you! Can these be refrigerated overnight somewhere in the process? Audrey, I have never tried refrigerating these at any point in the process. So, I can’t so with certainty. I’m guessing they could be refrigerated after the dough is all mixed together. I would take it out of the fridge in time to rise then roll out, rise and bake! These taste so good. Let me know how it works if you try it.